One of the niftier features of E-ink is that it is so low-powered that you can wirelessly beam power to a screen whenever it needs to be updated. Back in 2013 I showed a research project and a commercial prototype which used NFC or RF frequencies to power an E-ink screen. 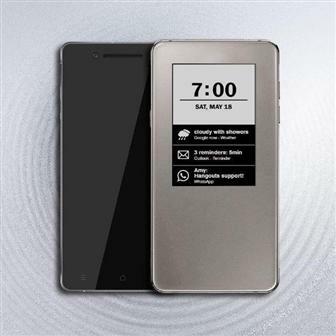 Now E-ink is developing a commercial solution built around a 2.9" screen, one which solves a perennial problem for powered smartphone cases. On Friday E-ink announced "a 2.9" turnkey ePaper solution for smartphone protective case applications. In other words, E-ink has developed the guts of a smartphone case design which is intended to compete with, and improve upon, products like the PopSlate and the InkCase. Those two cases were battery-powered and had to be several millimeters thick to fit the battery, but E-ink has found a way to improve upon the concept. The new design drops the battery in favor of an NFC chip which draws its power wireless from an NFC signal. That means a thinner case (a real improvement), but E-ink hasn't said anything about the software. Both the PopSlate and the InkCase came up short in that department, and if E-ink (or their licensee partner) then the new smartphone case will be thinner but not terribly more useful.